Support for marijuana legalization might be at a national all-time high, but not a single minute passes in U.S. without a cop pinching someone for weed. Crime data released by the FBI shows that police made 643,000 marijuana-related arrests in 2015, the lowest it's been in 20 years. That figure still translates to a pot bust every 49 seconds. And nearly nine out of ten of these arrests were for possession as opposed to sale or cultivation, the data shows. These new numbers come just weeks before nine states will vote on expanding legal access to marijuana, including recreational pot use in California, Massachusetts, Arizona, Nevada, and Maine. Four states — Colorado, Washington, Oregon, and Alaska — as well as the District of Columbia have already legalized the drug for recreational use. Medical marijuana is now legal in 25 states as well as D.C. 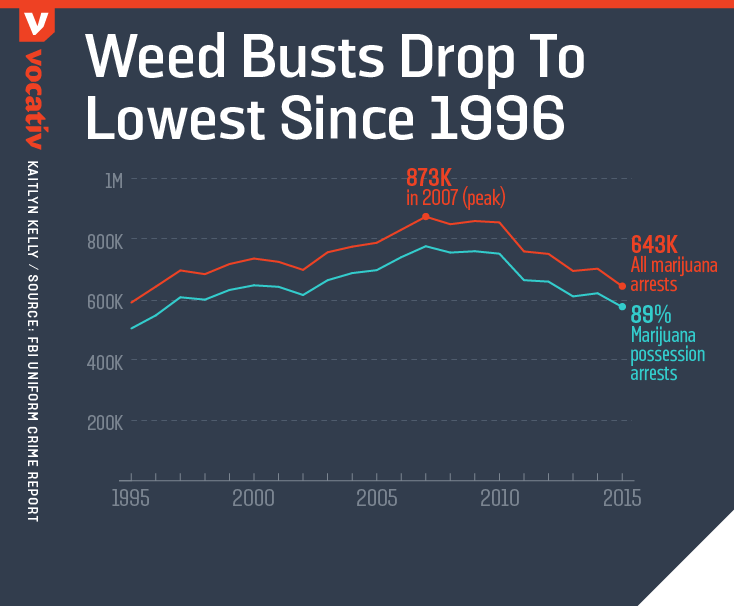 Despite a growing legal and cultural tolerance, low-level marijuana offenses continued to climb throughout the early 2000s. Weed arrests reached a peak of 872,720 — or an arrest every 36 seconds — in 2007, according to compiled FBI crime statistics. And as recently as 2013, taxpayers spent more than $3.5 billion annually to enforce laws against marijuana possession, according to the American Civil Liberties Union. States that allow recreational marijuana for adults have seen marijuana arrests plummet, data shows. In Colorado, for example, there were 95 percent fewer pot busts in 2015 than there were before the state legalized the drug in 2012. Should voters in places like California, the nation's most populous state, approve recreational pot use in November, marijuana arrests in the U.S. will almost certainly continue to decline. But for some advocates it's not happening fast enough. "While the numbers are thankfully dropping over time, it's alarming and simply unacceptable that someone is harassed by the police just for marijuana every 49 seconds in this country," said Tom Angell of the group Marijuana Majority in an interview with the Huffington Post. The post Cops Still Make A Marijuana Arrest Every 49 Seconds appeared first on Vocativ.